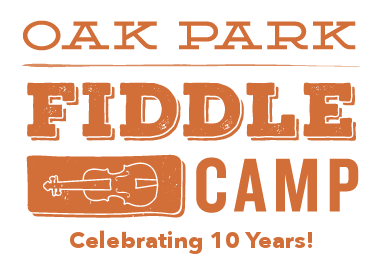 Oak Park Fiddle Camp will be held July 8-12, 2019. Fiddle camp is for students aged 6-12; if your camper is 12 or over, please consider signing up for Folk Workshop. Welcome to Oak Park Fiddle Camp! We are so excited to have you with us for an amazing week of fun and music. Fiddle Camp will be held from from 9am – 12pm each day, with a camper performance for parents and friends on Friday the 14th, around 11:15am. On Friday night we will have the annual scholarship benefit show at The Friendly Tap, featuring instructors, Folk Workshop students, and scholarship recipients. All are welcome to attend! As with years past, camp will be held at the 19th Century Club of Oak Park, located at 178 Forest Avenue in Oak Park, IL. Single camper tuition for the week is $250.00 and includes a camp T-shirt, snacks each day, and of course all classes and lessons. There is a discount of $50.00 for subsequent campers from the same family, and for the referral of a friend who attends camp. No violin, fiddle, or guitar experience is necessary, and for those who don’t own any, instruments can be purchased or rented (recommended for beginners) through OPFC for an additional $20.00 for the week, or independently from Austin Music or Kagen and Gaines Music Co. The camp experience does include a dancing component for everyone, so PLEASE make sure that your camper is aware of this. It will be a fun, low pressure environment and as long as everyone stays positive, we all have a great time! If finances are preventing your child from attending camp, PLEASE apply for a scholarship. We want to make sure that all interested campers are able to attend. If you have any questions or concerns about OPFC, please don’t hesitate to e-mail or call us!